Eng­lish band Field Music released its newest album this past week. Field Music (Mea­sure), a long (20 track, 70 minute) album is a col­lec­tion of most­ly unre­lat­ed tracks with the com­mon theme of being incred­i­bly repet­i­tive and for the most part, vast­ly unin­ter­est­ing. The album has some fair­ly strong tracks, but a few among a full score is sim­ply not enough to give Field Music (Mea­sure) a score that is any­where near decent. One of the most instant­ly rec­og­niz­able fea­tures of tracks on Field Music (Mea­sure) is that they are noth­ing like their pre­ced­ing track, and as a result, Field Music (Mea­sure) is diverse to a fault. It’s hard to find any sort of con­nec­tion between neigh­bor­ing tracks, let alone a sense of direc­tion for the album as a whole, when a atmos­pher­ic, some­what dark track is fol­lowed by a typ­i­cal indie-folk track, or when that indie-folk track gives way to, say, one that sounds like Steely Dan, or per­haps anoth­er that, at least ear­ly on, resem­bles The White Stripes. But tracks tak­en indi­vid­u­al­ly can, on rare occa­sion, sound rea­son­ably good; one exam­ple of this is “All You’d Ever Need to Say,” which eas­i­ly has the most inter­est­ing, most able to stand up to end­less rep­e­ti­tion, back­bone on the album. Vocal­ly, Field Music (Mea­sure) is quite vari­able. On the best tracks, the vocals are among the most cre­ative ele­ments. On weak­er tracks, they tend to sound quite gener­ic. This vari­abil­i­ty through the album isn’t sur­pris­ing, giv­en its length. How­ev­er, it cer­tain­ly con­tributes to the album’s inabil­i­ty to main­tain a decent lev­el of qual­i­ty all the way through. It would be great if the Of Mon­tre­al-esque falset­to har­monies that dis­tin­guish “Let’s Write a Book” showed up again dur­ing Field Music (Mea­sure), but Field Music seems gen­er­al­ly to dis­card such cre­ative ideas far too quick­ly in favor of more gener­ic indie/rock vocals. Field Music (Mea­sure) proves that Field Music is quite capa­ble of inter­lac­ing inter­est­ing ideas and images through their music, even on such a drawn-out album as this. The degree to which the lyrics com­ple­ment the music is quite impres­sive as Brewis sings of being “Close enough / In the mir­ror” on “In the Mir­ror“ ‘s dark open­ing to Field Music (Mea­sure), and, at least for the first part of the album (and select parts of the lat­er sec­tions) this con­tin­ues. How­ev­er, on the duller tracks there’s not much to work for, and so no mat­ter what Field Music has writ­ten, it doesn’t have much oppor­tu­ni­ty to stand out. The over­whelm­ing major­i­ty of the prob­lems in Field Music (Mea­sure) lie in the vast amounts of rep­e­ti­tion and length­i­ness. Most of Field Music’s tracks have one main sec­tion, con­tain­ing a high­ly repet­i­tive, over­ly dom­i­nant back­bone that can range from elec­tric gui­tar lines to the uni­form plunk­ing of sin­gle key­board keys. The obvi­ous prob­lems that occur with what can, per­haps, be best described as a tedious dirge are mag­ni­fied expo­nen­tial­ly in the face of such an enor­mous album (note that not one of the 20 tracks is short­er than two min­utes). By the halfway point it feels as if the album should be end­ing, and the sec­ond half of the album is actu­al­ly some­what painful. The final blow the album deliv­ers is, nat­u­ral­ly, the final track, which spans near­ly 10 min­utes. Of course, a ten minute final track seems to be more an ide­al that Field Music decid­ed to uphold than an actu­al usable con­cept, as (the appro­pri­ate­ly named, for the final track) “It’s About Time” has bare­ly any work­able mate­r­i­al. The first half con­sists of ran­dom frag­ment­ed vio­lin notes, the track con­tin­ues on to a long sec­tion of com­plete silence, and the final part of the track has arbi­trary ambi­ent record­ings. 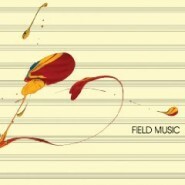 First and fore­most, Field Music (Mea­sure) should not have twen­ty tracks. Quite sim­ply, it can’t sus­tain itself for that long, which is a pity as the album’s few best parts aren’t bad. Those good sec­tions explore a vari­ety of musi­cal styles and direc­tions; how­ev­er, these are entire­ly over­shad­owed by the large num­ber of gener­ic tracks, and so Field Music (Mea­sure) doesn’t even meet up to the stan­dard of mediocre. There are inter­est­ing bits here and there - but to get to them, you’ll have to slog through over an hour of alter­nat­ing tedi­um and rep­e­ti­tion.